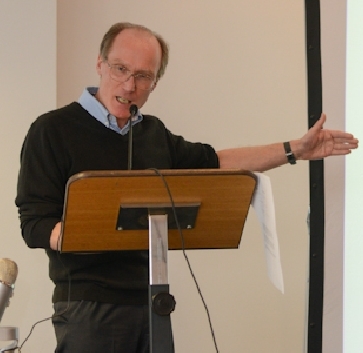 Launched in 2013, the matrices are portals to the most important research and guidance for British treatment services and for practitioners, managers, and commissioners. Use them to train staff, for professional development, or just to re-experience the revelations made by the seminal and key studies of the past 50+ years. Familiarity with this research and guidance can be seen as a quality indicator, demonstrating that your staff and service are aware of the evidential foundations of their work. Each matrix consists of a 5x5 table totalling 25 cells, segmenting treatment in to the major practical divisions relevant to its effectiveness and delivery. Within each cell are the main historical and contemporary research landmarks on these different aspects of treatment, reviews offering a panoramic view, expert guidance based on this research, and an option to explore beyond these dozen or so selected documents. The matrices were developed for the UK by Drug and Alcohol Findings for the Substance Misuse Skills Consortium to promote the development of drug and alcohol treatment services and the treatment workforce. In 2014 the Society for the Study of Addiction joined the other partners in financially and practically supporting this initiative. Alcohol Treatment Matrix for brief interventions and treatment of alcohol-related problems including those intended to safeguard the community and reduce crime. Drug Treatment Matrix for harm reduction and treatment of problems related to the use of illegal drugs, including treatment-based interventions to safeguard the community and reduce crime. Matrix Bites Weekly cell-by-cell introduction to the matrices cumulating in to a year-long foundation course on the treatment evidence base. Each bite remains stored in the relevant matrix cell – click cell and unfold bite using link at the bottom, or go to alcohol and drug course résumés. For updates add yourself to the mailing list. 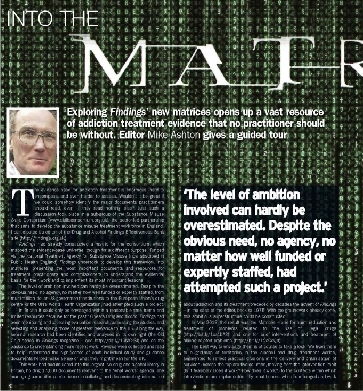 Into the matrix Freely available feature article in Drink and Drugs News (DDN) magazine on the origins and purpose of the matrices, described by the editor as “a godsend for practitioners and commissioners”. 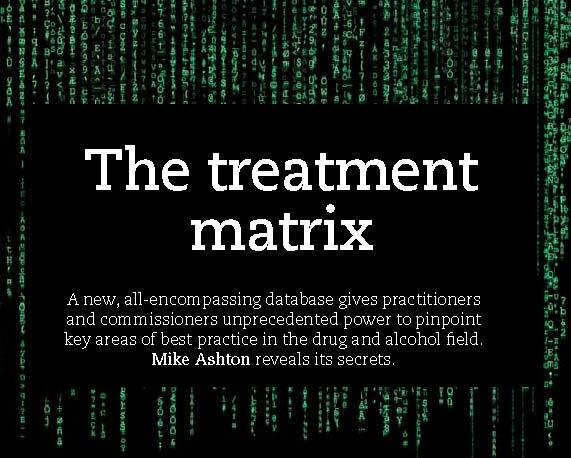 The treatment matrix Feature article in DrugScope’s Druglink magazine September/October 2013 describes how the matrices were built on the largest live drug and alcohol library in Britain and the work of the Effectiveness Bank over the past 16 years analysing UK-relevant research. FEAD video See and hear Mike Ashton the matrices’ developer explaining their genesis and construction in a video from the 2013 conference of the New Directions in the Study of Alcohol Group. Slide presentation Featured in the video above. 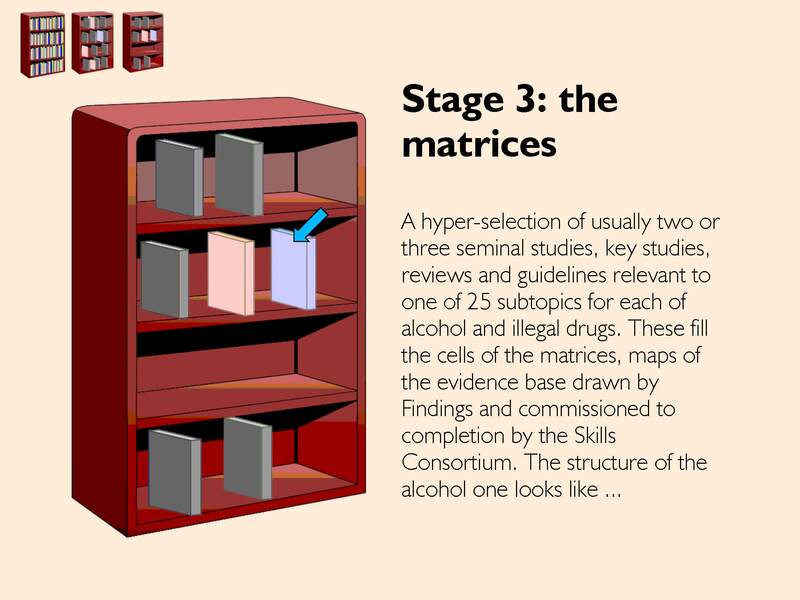 Drills down to one study in one of the 25 cells of the alcohol matrix, illustrating the riches to be found there and the contemporary relevance of the seminal studies. Prezi animation Explains the the significance of the matrices and takes you on an introductory tour showing what they contain and how they can be used. From around the world appreciation for the “awesome”, “brilliant” matrices and Matrix Bites courses. Affiliations as at time of comment. Leaving the site? Please help us evaluate, sustain and develop the service by giving us your feedback. This brief survey takes only two minutes to complete.